Product prices and availability are accurate as of 2019-03-31 08:02:29 EDT and are subject to change. Any price and availability information displayed on http://www.amazon.com/ at the time of purchase will apply to the purchase of this product. 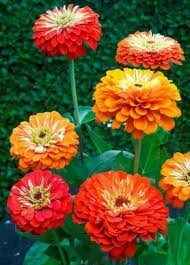 This bright and cheerful orange mixture of Zinnias will bring character to garden. Fast growing, great choice especially if a quick improvement is needed!